KODX is now broadcasting and streaming Mondays through Saturdays from 11 a.m. through 5 p.m.
12 PM – Democracy Now! 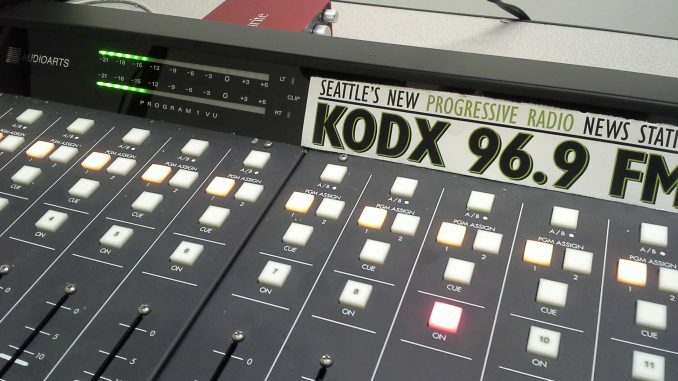 I am so excited to have local progressive radio back in Seattle! Is it streaming yet? I live in West Seattle. Thank you for all of your work to get the station operating. We are now in testing mode for streaming (during current broadcast hours). You should be able to see a streaming option in the bottom right corner of the main page. Hello. If you are looking for some locally produced programming, I produce a weekly radio program out of Olympia called the Thunderbolt. I have been airing on KOWA, 106.5 FM Olympia for four years (though I recently disassociated with KOWA), I currently air on KHUH, 104.9 FM Seattle, and I will be airing soon on KAOS, 89.3 FM Olympia. I would also like to offer my show to your station. I do politics, music, dumb jokes, and for Olympia listeners I also have a local activist events calendar. I can absolutely guarantee that you have never heard anything even remotely resembling what I am doing.